Upgrading patterns. GAH! WHY DO I HAVE TO DO IT???? 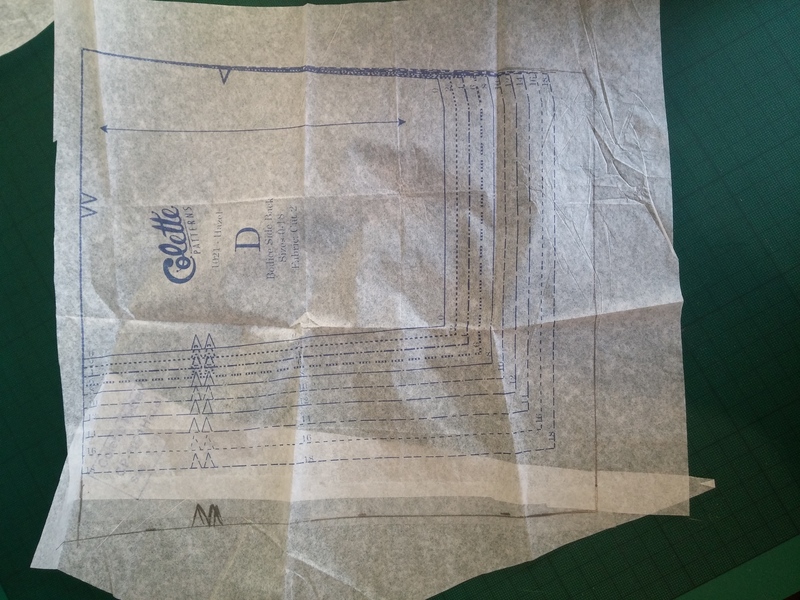 Knit Colette patterns are in a size range of their own, which means very little to English people… what is 3XL? Is it 3 times as big as an extra large? Or three ‘sizes’ up? How big is a size? Who cares. 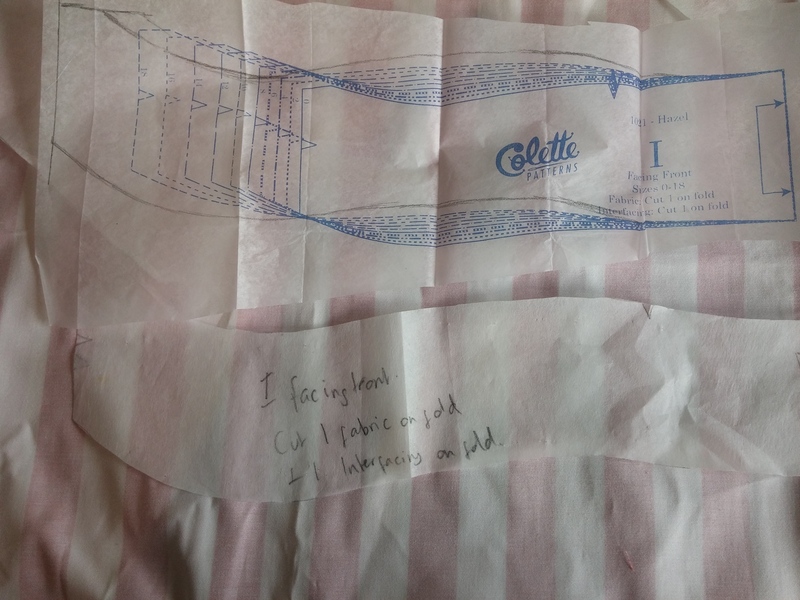 I was happy with my Moneta pattern to not have to choose the biggest size on the pattern packet. That was very joyous. And apart from lengthening the bodice, no alterations were needed. The joy of knits! Woven Colette patterns are a different matter. They are gorgeous, but I’m bigger than the biggest size. But I wanted the lovely Hazel, the pattern said it was easy, and I thought I should have a bash at upgrading as it is a skill I am going to have to get used to. 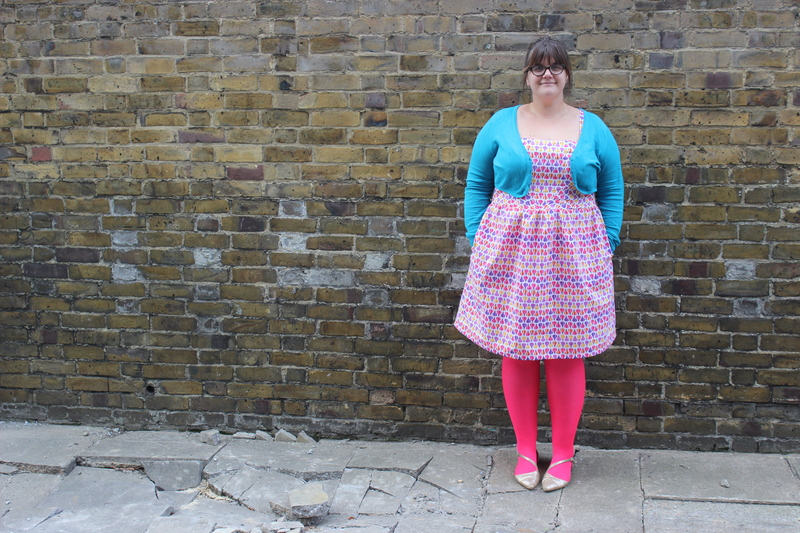 I seem to be one or two sizes bigger than the biggest size of all the patterns I covet. Ho hum, it’s just like shopping in high street stores all over again. I THOUGHT I WAS DONE WITH FEELING TOO BIG! BOO HOO. 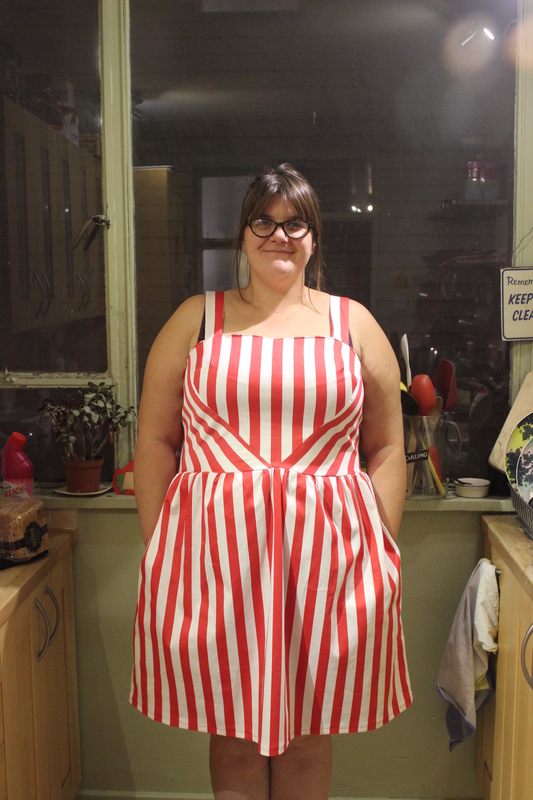 Anyway, enough of my sob stories: I did make a pretty swish dress! This is actually my wearable muslin in cheapy polycotton, but I think I like it more than the proper version (more of which later). The fabric has lantern-like hot air balloons in jewel colours all over it, and its lovely. 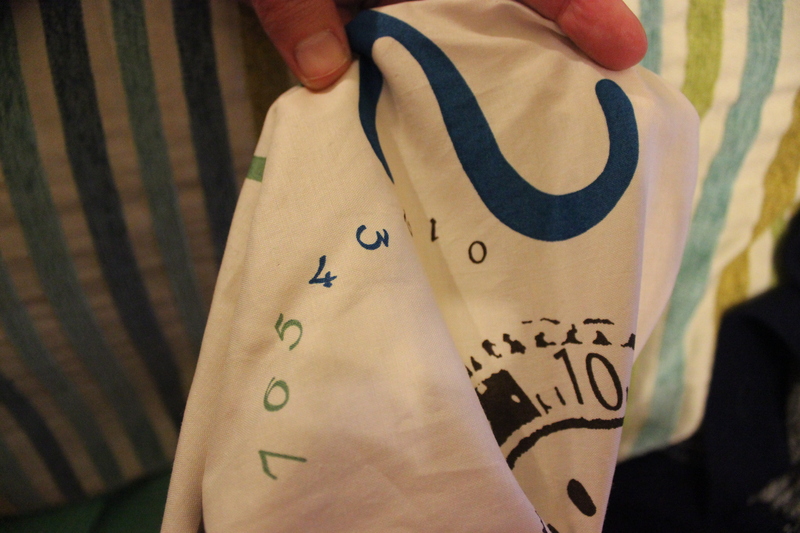 And though it was super starchy at first, it has softened really nicely after a couple of washes. So how did I upgrade it? I did some maths. I worked out that the largest size (18) was two sizes too small at the bust, and three sizes too small at the waist. But as I was too scared to try and grade between sizes and also do a full bust adjustment on my imaginary new size lines, I just opted to upgrade by 3 sizes, or 6 centimetres all over. I figured I could bring the straps in towards my neck to deal with any over large bust issues and this would also deal with my narrow shoulders. Also, I am an F cup, and I had no idea how to do a full bust adjustment on a V shaped bodice, so I just went big all over. Which worked surprisingly well, in the main. I love this dress, apart from the strange sticky out armpit bits. Something has gone wrong and weird with my upgrading of the facing and one of the bodice panels that means that I have a very gapey underarm. I should have taken a picture of this, but I have failed to. But needless to say, the bodice side under my arm seriously curves outwards, like a lipped bowl. 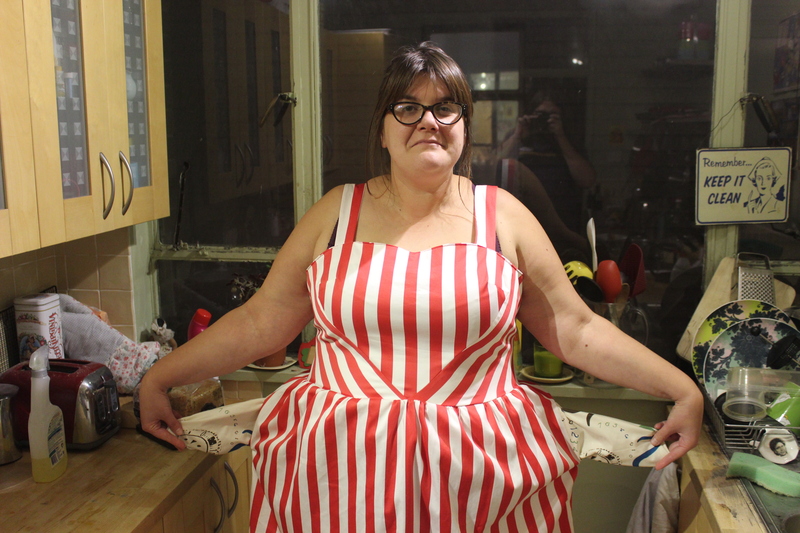 I have made two of these dresses now, and can’t work out what I have done wrong. In both versions I took a lot of width out of the bodice panels either side of the zip, because I definitely did not need to upgrade three sizes in the top half of the bodice, so had to take fabric out of the first version, and amend the pattern piece for the second one, but this has not cured the gapey underarm problem. I think I need to go back to the drawing board with this one. The curves are in the wrong places because I took some fabric from the bodice. It might also be something to do with the fact I didn’t use much maths when upgrading the facing. I freestyled. 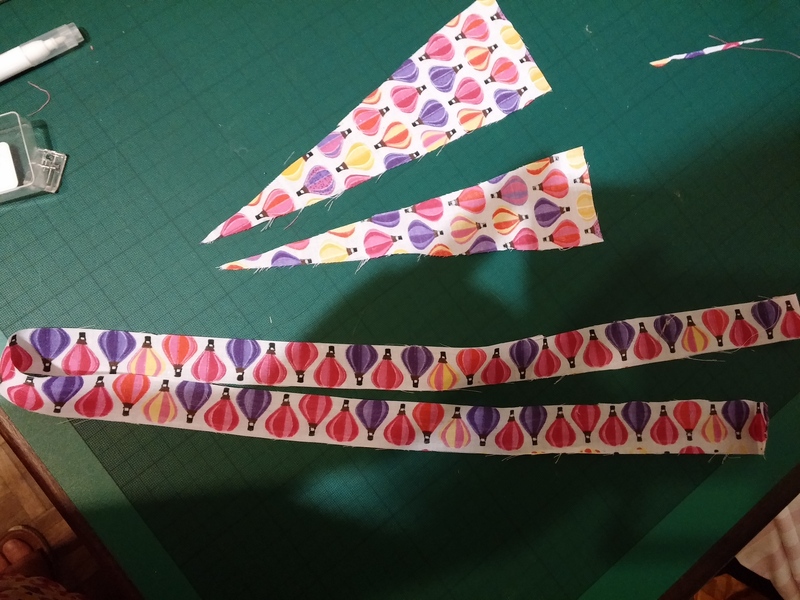 OoooOOOooooHHH wavy lines……! 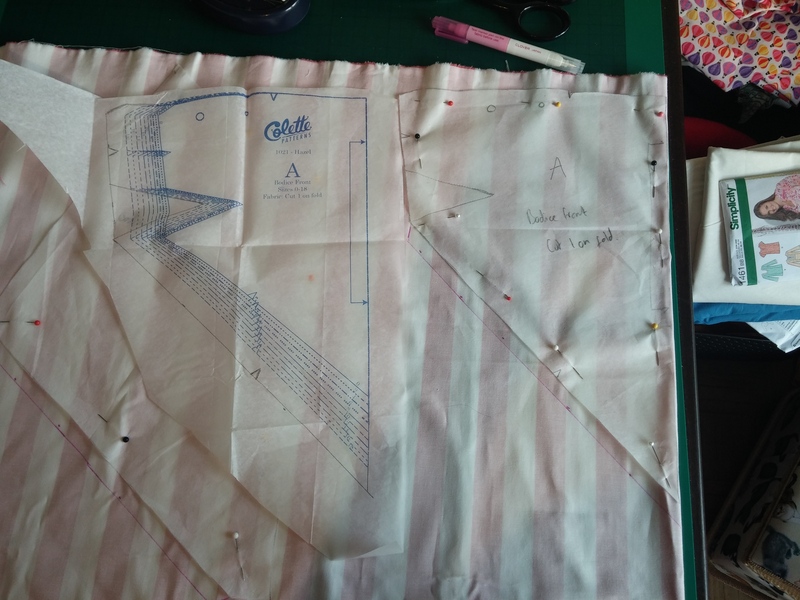 In the first one, the bodice was a bit short, and to make it longer I had to attach the skirt below the point of the V. This looks fine, but isn’t proper. 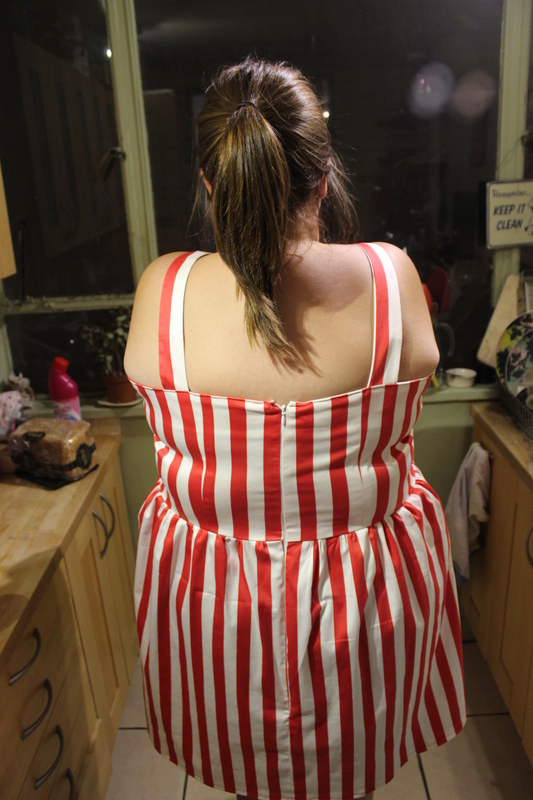 In the second one, I lengthened the bodice a bit which I thought was clever, because of the V. I realised I needed to make the V wider, to make it longer, though now I am writing this, that might explain my gapey armpits!! But how else would I make it longer without changing the angle of the v and messing up all of the other panels?!? Oh why oh why do I have to upgrade?! Anyway. I put in an invisible zip rather well I thought. Nice zip, weird strap placement. I shortened the straps to deal with my slopey shoulders by bringing them in at the back, forgetting about bra wearing. I like the way the straps look, but it needs a strapless bra. I’m really pleased with this frock, which was only ever meant to be a trial one. It’s partly my very apple shape, and partly my weird gather placement, but does make me look a little pregnant though…..
And I got a really nice pointy V on the bodice. 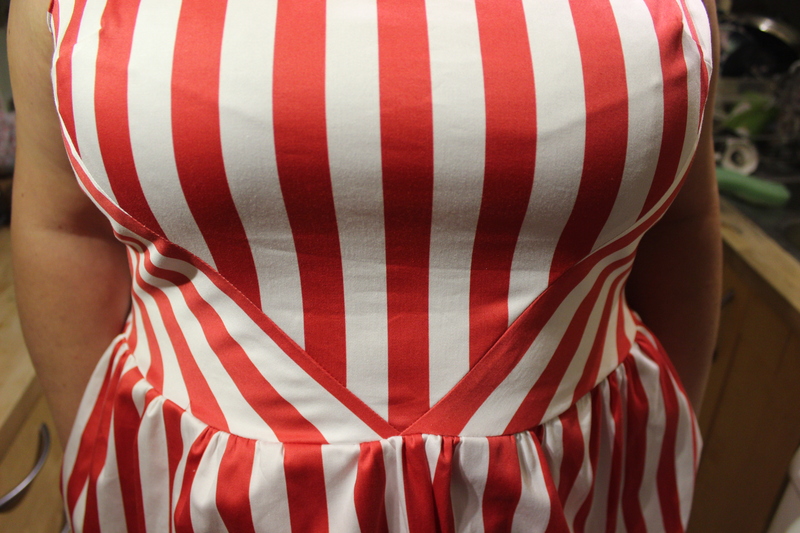 It’s a very va va voom style when you play with stripes! I used some totally hideous but really soft cotton from a pot luck pack of remnants for the pockets. It has clocks on it and is really nineties, in a bad way. 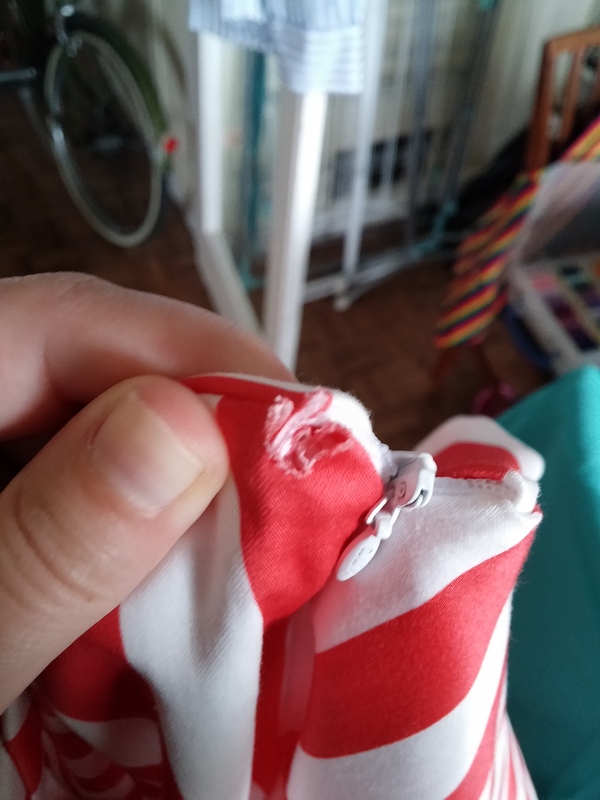 I shouldn’t sew when I am tired and grumpy. More haste, less speed Sparkleneedles, pay attention. But a little darn, a little hem, and it was done. Ta da! 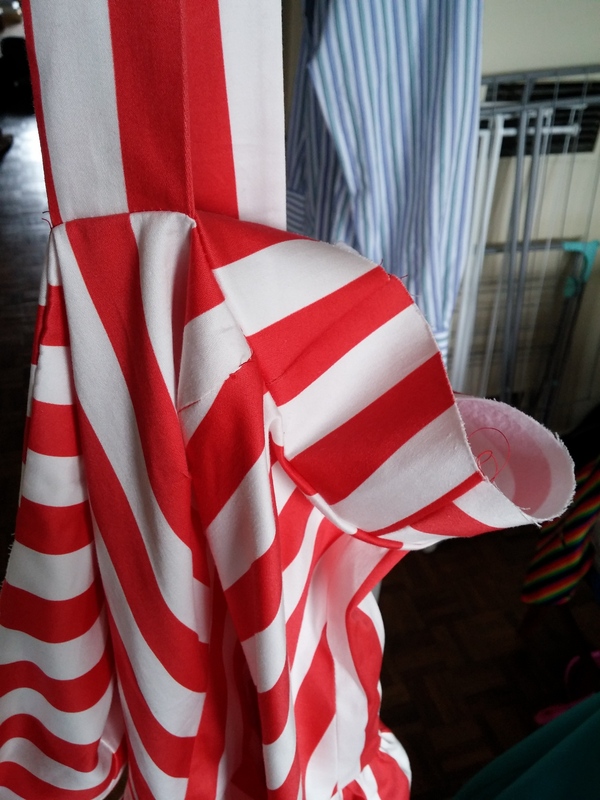 The circus tent dress! Have you had any upgrading trials or triumphs?